I’m so happy that I’ve finally found the time to sit down and write the recipe for these beauties. Think buttery, flaky pastry filled with crunchy almond praline. The caramel melts and oozes out of the pastry when they bake creating perfect little crunchy corners. Hungry yet? Yes, these pastries really are that good. Since I started The Breakfast Club, I’ve tried a few recipes for breakfast pastries, but nothing really hit the spot, they were all too bready and heavy. The secret, it seems, is to use way more butter than seems necessary. The inspiration for this recipe came from Nordljus, but I tweaked it to make it a little easier, taking inspiration from Nigella ’s processor puff pastry along the way. 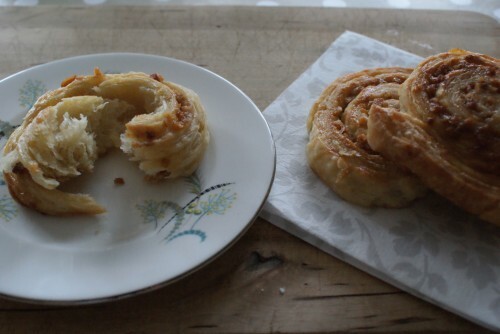 Don’t be put off by the length of the recipe below, it does take rather a long time, but it’s not too taxing (and it’s actually very satisfying to make Danish pastry). You need to start the recipe the day before, but this means you spread out the tasks and can actually start it several days before. Having said that, I would probably save this for when friends come over, but then secretly freeze some to defrost and bake at another time. And one more thing, the praline can be made in advance and will keep for several weeks in an airtight container, I urge you to make double and store it in a jar ready for sprinkling on ice cream. Heat the sugar and water, swirling gently, for about five minutes, or until the sugar melts and becomes a golden caramel. Remove the pan from the heat and stir in the nuts with a spatula. Pour the mixture onto the tray and leave to set. Once the praline has set, blitz it in a food processor to a coarse rubble. Store in a jar or airtight container. Whisk the water, milk and egg together in a jug. Blitz the remaining ingredients briefly in a food processor (you still want large chunks of butter). Tip this into a large bowl and stir in the mixture in the jug. Don’t worry if it looks like a gooey mess. Cover the bowl with cling film and leave in the fridge overnight or for up 3 days. Take the dough out of the fridge and leave it for 30 minutes to get to room temperature. 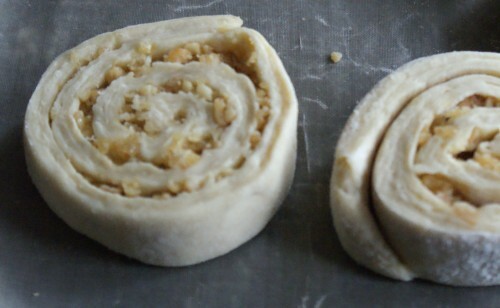 Roll the dough out into a large rectangle (about 35cm x 70cm). Fold the dough into thirds, one third on top of the other. Remove the dough from the fridge and roll each piece into a 35cm x 70cm rectangle on a lightly floured surface. Sprinkle over about one-third of the praline. 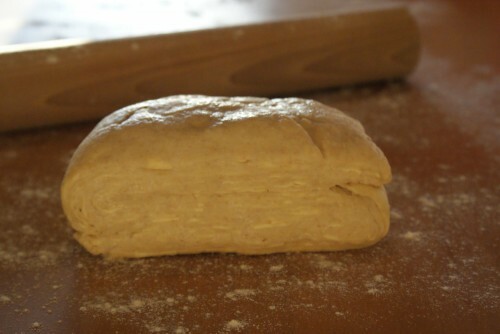 Starting with a short edge, roll the dough up tightly and place in the fridge for 20 minutes. Repeat with the other piece of pastry. Cut the logs into 2cm slices and place, face up, onto baking trays lined with greaseproof paper, making sure they are well spaced. Sprinkle over the remaining one-third of praline and pat it into the dough. You can freeze the pastries at this point. To cook them, remove from the freezer, allow to defrost, then continue the recipe below. Cover the trays with a tea towel and set aside to rise for 1-2 hours, or until doubled in size. Preheat the oven to 220C, place the trays into the oven then reduce the temperature to 180C. Bake the pastries for 15 minutes, or until golden-brown and the pastry is cooked. Am so glad you have posted these, was drooling over the pictures at Nora’s blog! They really do look delicious! I love these !! they’re absolutely irresistible ! !